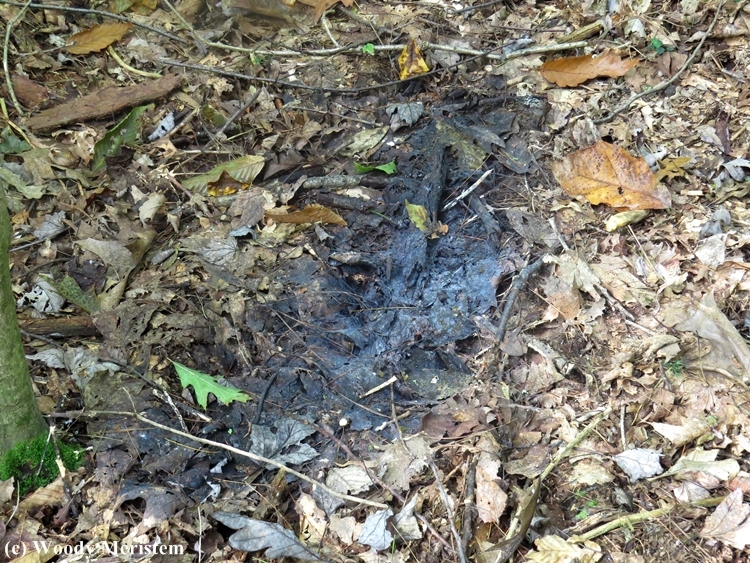 It’s fall and beneath some of the smaller American beech in the Big Woods is a black or dark gray mess. The mess is honeydew, the sugar-filled waste of insects. Large quantities of honeydew drip to the ground and provide food for a sooty mold fungus which covers the honeydew. That stuff is worth investigating, not necessarily by examining it closely, but by looking up. 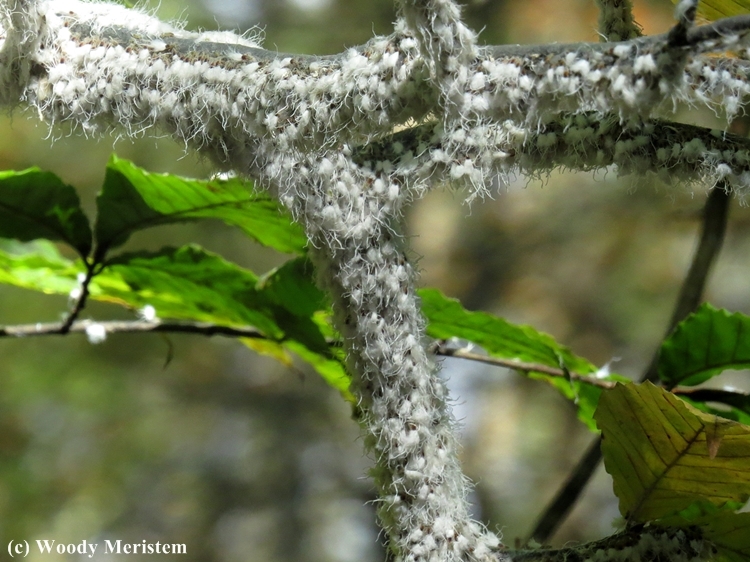 Above you will find small branches or twigs covered with what, at first glance, looks like snow. But snow it’s not, instead that “snow” is actually a mass of insects, small white insects. Those are beech blight aphids (Grylloprociphilus imbricator) that feed on the sap of American beech trees by piercing the thin bark on twigs and small branches with their piercing-sucking mouthparts. 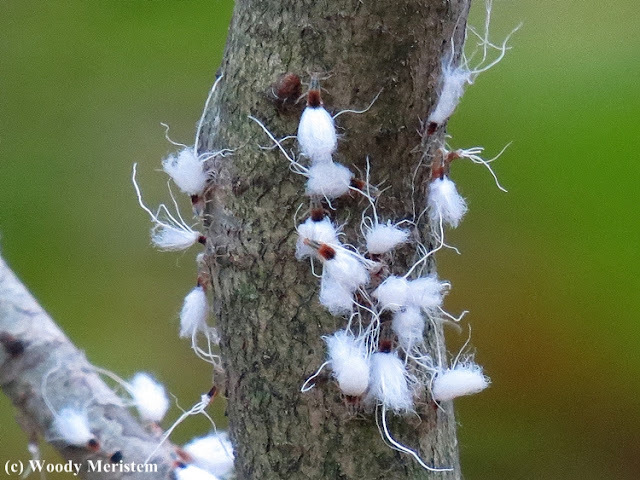 The common name of “beech blight aphid” is a poor choice of name; beech trees have been dying for decades from what some people call "beech blight" which is actually an insect/fungus combination – but not this one. The beech blight aphid does not kill trees, it doesn't even do significant damage to the trees. 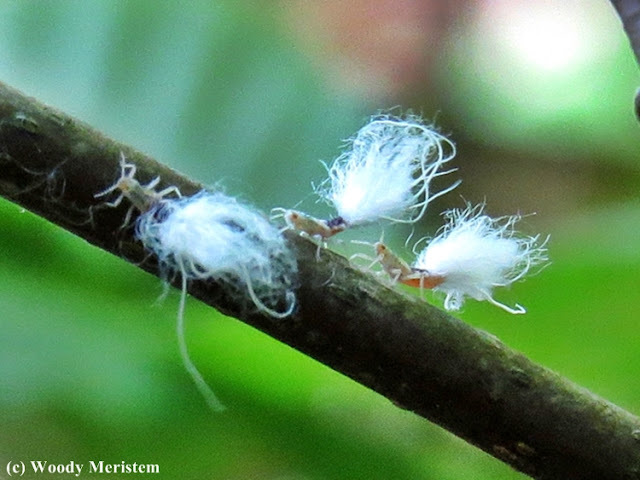 The aphids exude long white waxy strands from their abdomens, those strands make a mass of these insects quite noticeable. The aphids don’t rely on the waving to deter the threat, instead it’s used to disperse a warning scent to their fellow aphids. The aphids are quite aggressive, a number of them will swarm the threat and stab it with their piercing/sucking mouthparts which frequently drives off a potential predator. Wow, wow, wow!!! How cool is that! Thanks for sharing your photos and the information. What a wonderful thing to see!!! !It's a shame it's mis-named. Very cool, indeed! I could imagine boogie music as they were waving their pheromones about! Those aphids made me itch, but what a cool thing to see. Great post and neat looking insect. What a sight to see. Great photos. Hello. An interesting looking insect! Great photos!